Writing about Copernicus I went through my archives in search of photographic illustrations. Among the multitude of images (as I passionately take photos always and almost everywhere,), I found photos of Bartholomew Schachmann’s epitaph. And I immediately recalled the mystery from the Nowy Dwor Gdanski. 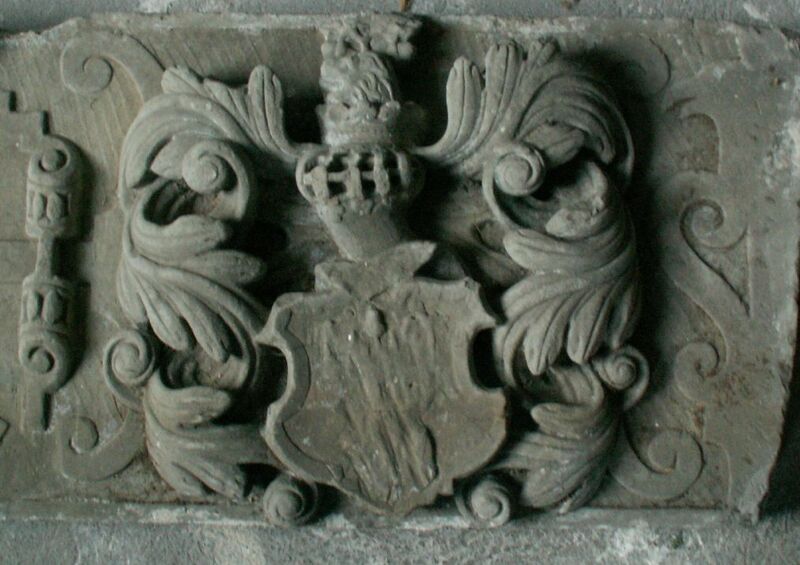 Well, after entering a bit dark interior of the museum in Nowy Dwor Gdanski, where the Mennonite stelae are stored – I noticed a heraldic cartouche, quite incongruous both in style and content. When I asked the lady showing us around – if she knew whose coat of arms was on the shield (as it was very much destroyed by time and someone’s hand) she said no one knew. The stone was brought here and left without any further explanation– that was all. I returned home and started to rummage through Siebmacher’s armorial because the coat of arms – or should I rather say the crest, seemed familiar to me. But even before I went through Siebmacher, I fund it in St. Mary’s in Gdansk – where I went with my camera, to put the stress away. Taking again and again the pictures of the epitaph of Bartholomeo Schachmann – I noticed THE coat of arms.… It was the Schwarzwald family coat of arms. Why then the Schwartzwalds if I am writing about the Schachmann epitaph? The explanation is seen in the lower part of the epitaph. I also found some information on his family. In the incunabula collection of the Gdansk library of the Polish Academy of Science, there are some old books. They once had belonged to the famous marquise d’Oria, also to the church libraries, specifically the St. Peter and Paul Church library. This one was incorporated to the Municipal Library in the 19th century. And P.A. o. S. is in some way its successor. And this book collection was, until present times, considered to be the remains of the so-called Schwartzwald Library (owned by Heinrich Schwartzwald) – 16th century. Those were times of the family’s ennoblement – so it was natural that, with the ennoblement – came education, and maintaining the library was nearly a necessity. 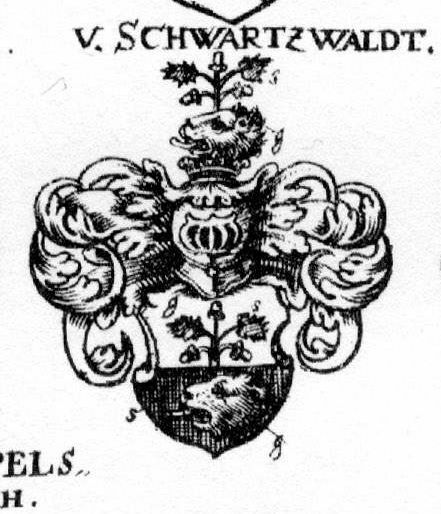 The Schwartzwalds were Calvinists – so the St. Peter and Paul’s library was the place for the books (with their family coat of arms). 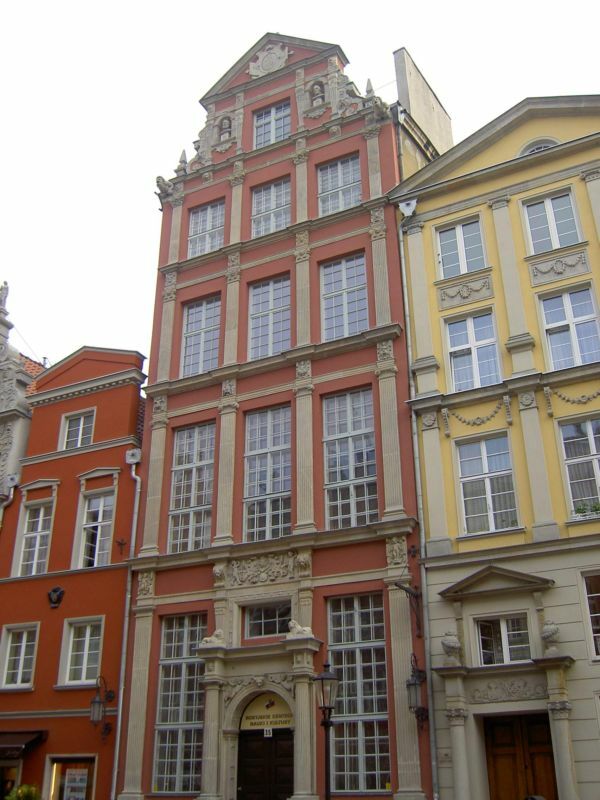 In Gdansk the Schwartzwalds owned the so-called Lion’s Castle, a house located at No. 35 of the Long Street. There is historical information about the wedding of Katherine née Schwartzwald with Matthias Zimmermann, which took place in October of 1562. This particular weeding echoed in the city and far beyond – as it broke all the anti-luxury rules (issued in 1540 and restricting the number of meals at weddings). Unfortunately in 1572 Katherine became a widow. In 1573 she remarried – this time it was Michael Kerl. The couple lived in his house at 29 Long Street. In 1586 Katherine again became a widow, and this time an excellent match occurred – it was Bartholomeo Schachmann himself!!! On the epitaph of Schachmann in St. Mary’s in Gdansk – besides Anna Blemke (equally good match) Katherine is mentioned. She could not be omitted – as she was the daughter of the family ennobled by the Emperor Charles V! 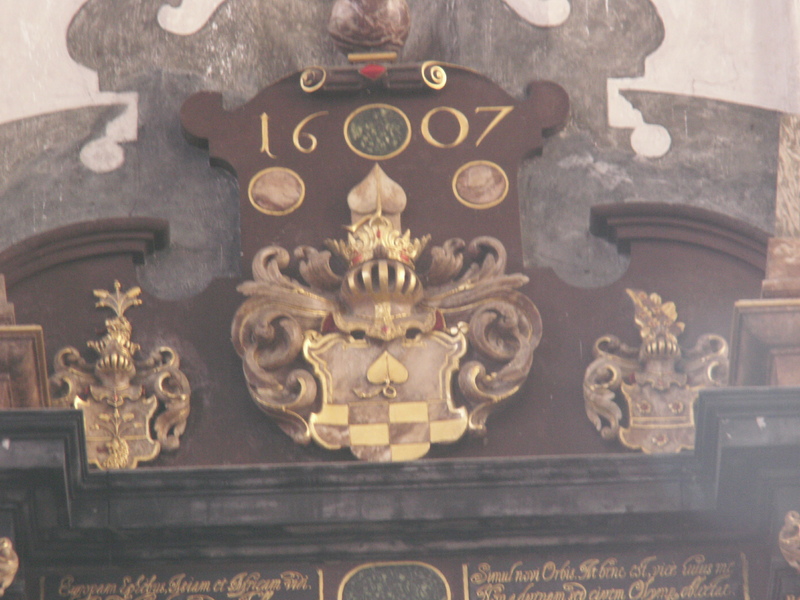 On the epitaph of Bartholomeo Schachmann – Katherine Schwartzwald’s coat of arms is placed on the heraldic right side – above the entablature. The epitaph can be seen on the south pillar of the transept.